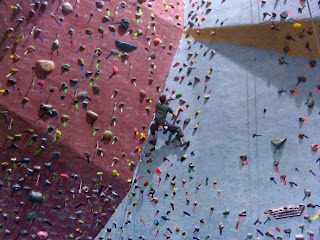 A climber on the lead wall at Go Vertical. Sunday was what I'd consider almost a rite of passage for any climber. I watch "The Sharp End" regularly, I marvel at the trad and sport climbers I know from the gym, and I've always been a bit too afraid to really test my limits on lead. A friend taught me to lead outside this spring, but still, the extent of my leading experience was minimal at best. I'd been itching to really learn how it's done, and perhaps someday to look as calm, cool, and in control of those climbers I admire. 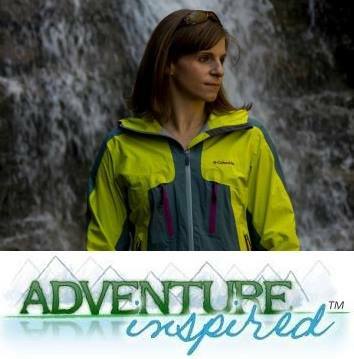 It's like the first time you climb something you know you can't do, like buying your first pair of perfectly fitting rock shoes to help elevate your climbing, like a first attempt ever on an overhang... leading is like taking the training wheels off, for real. 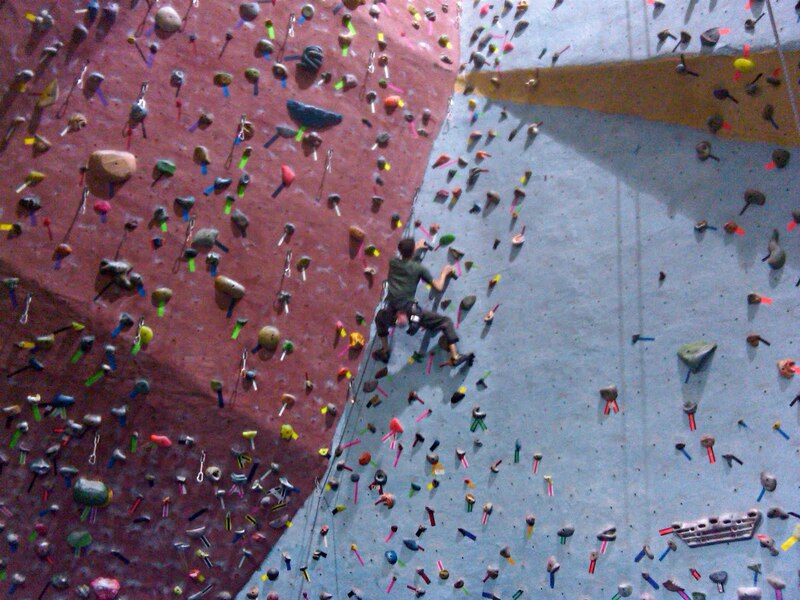 I spent a total of six hours at Go Vertical yesterday taking a lead climbing class from the gym's owner, Howard. Howard's been climbing since before my existence was even a whisper - 40 years of trad, sport, and many years of owning the largest climbing gym in Philly. A good friend and I have been working on planning a trip to the Gunks in August, and as much as I wanted to just go up there and wing it, my climbing partner convinced me we'd all be better off if I took a proper class. I found myself at Go Vertical just before 10am Sunday. The gym doesn't open until 10, and walking in to a completely empty, dark expanse of ropes, shadows, and chalk marks was pretty neat. There were three of us in the class, all at the same toprope level and with the same leading experience. We spent the first hour of class learning how to clip without exposing our hands to the gate of the caribiners, and how to do it from all sorts of awkward positions. It took all of us a bit of time to pick up, but I'm sure it'll be routine in no time. After a short break, we headed over to a few 5.6-5.7 lead routes in a part of the gym the three of us affectionately called the Forbidden Wall - forbidden to those who don't know how to lead! We'd do 4-6 bolts on each route, learned the basics of belaying, catching falls, and giving enough slack. Taking up the rope by running away, i.e. backing up to remove an extra bit of slack instead of by belaying with the rope, was my favorite part. The next and final step in the class was mock leading entire routes. We practiced for a while, and by 2pm, we were ready to take the lead test. For the test, the toprope came off and we really had a chance to test what we learned. We all passed, and now I'm officially a lead climber! Indoors, at least. Nina came to climb just as the class was finishing up, and despite being dead tired, I stuck around to climb and chat a little longer. On the subject of fear: I think leading was so much fun because I'm so completely focused on making clip-to-clip movements that I forget to be afraid. Of course, I haven't taken any real falls yet, nor gone to the top of my ability on a lead route, so we'll see how long that lasts! I'm hoping that after a few weeks of leading, my fear of falling might dissipate a bit. Or at least I'll have a little more experience dealing with it! And it's much easier to take a rest toproping, while with lead, if you've climbed past the clip and give up, the consequence could be a long fall. I won't be able to take it easy on myself anymore! Are you a climber? Do you remember when you first learned to lead? Are you hoping to learn someday soon? Leave a comment! What a great account of what sounds like a great experience. You're going to have so much fun in the Gunks next month, and I look forward to the trip report! I still remember my lead class...I didn't pass first time and even after I had passed I was a little bit of a headcase thinking I had to be perfect at it...nope! Just gotta be willing to give it your best shot no matter what kind of day it is. Leading outdoors entails so many different variables and technical aspects - hopefully your friend spent a number of days and hours teaching your trad leading. It is something that takes a while to get competent at - so if you need more practice time, definitely go often with a mentor or hire a guide to work on your trad leading skills. The Gunks are the perfect place to practice - so many easy high quality climbs - stick to very easy grades so you can focus on the leading and not the climbing skills and work your way up. Be safe out there! Great writing Katie! Felt like I was there. You're going to be gliding across the ceiling in no time. I am so excited for our trip!